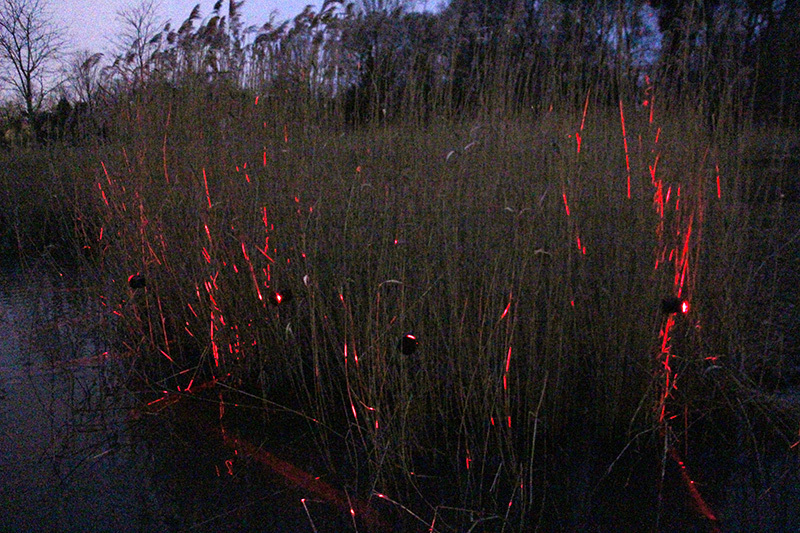 Laser lights moved by the wind scan a reed bed. For four winter nights, an exhibition of 16 light installations and sculptures will take place in Park Frankendael, located in the east of Amsterdam. The artworks are dispersed over the park grounds; walk from one artwork to the next in this historical park that includes a monumental country house, a baroque garden and a real folly. The artworks are made in a variety of styles; most of them are based on old school techniques like neon, tube lighting, overhead and slide projections, and the good ol’ light bulb. Restaurant Merkelbach or the clubhouse of Scouting Frankendael. Maps are available for free at the starting point of the route near the main entrance of the park, next to Huize Frankendael on the Middenweg. Tram 9 stops nearby. Parklicht exhibits light art by Leonard van Munster, Esther Hoogendijk, Hans Runge, Joris Strijbos, Wouter Kops, Nicky Zwaan, Egied Simons, Paul Baartmans, Robert Roelink, Arno Scheper, Jeroen Werner, Fleur van Greuningen & Willem Sjoerd van Vliet, Eric Martijn, Bas Peeters, Diana Ramaekers and Dries- sens & Verstappen. Parklicht has been possible by the support of the Gemeente Amsterdam stadsdeel Oost, Amsterdams Fonds voor de Kunst, Amsterdam Light Festival, Huize Frankendael, Restaurant Merkelbach, Restaurant de Kas, Scouting Frankendael and Stichting Vrienden van Frankendael.